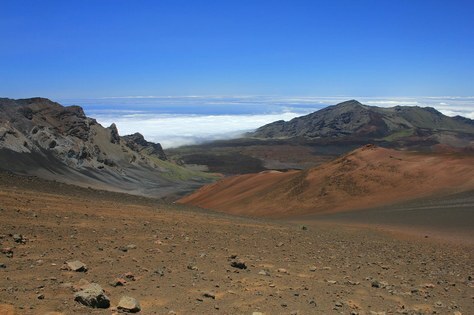 You are here: Home / Blog / Explore Maui's Haleakala National Park! Explore Maui's Haleakala National Park! Don't miss this great opportunity to escape the northwest gloom and renew your spirit, with an unforgettable hiking adventure in March 2015 through the backcountry of Maui, amid stark volcanic landscapes and sub-tropical rain forest. Join long-time Mountaineers trip leader Royce Poetter for a five-day getaway in Maui's Haleakala National Park next March. First, backpack for 3 days in the crater of Haleakala, Maui's highest peak, and stay in the National Park's Hōlua and Paliku cabins. Then spend a day at Ohe’o Gulch enjoying the many waterfalls and warm pools, camping 2 nights at nearby Kīpahulu campground. Finish the trip with a drive back along the scenic Hana Highway and an overnight at the Maui Seaside Hotel. Maui's weather is ideal in the second half of March, with warm but not hot temperatures and a reduced chance of rain. Sign up for the trip!